We are proud to announce that WP Engine has named WP101 as a Recommended Solution for WordPress Education. It’s no secret that we’re big fans of WP Engine. In fact, we’ve been a customer since March of 2012, back when there were just a couple thousand of us. Today, WP Engine powers hundreds of thousands of WordPress sites for more than 80,000 customers around the world! As part of their award-winning customer experience, they filter through thousands of WordPress plugins and solutions, and then recommend the best of the best within the WP Engine Solution Center. 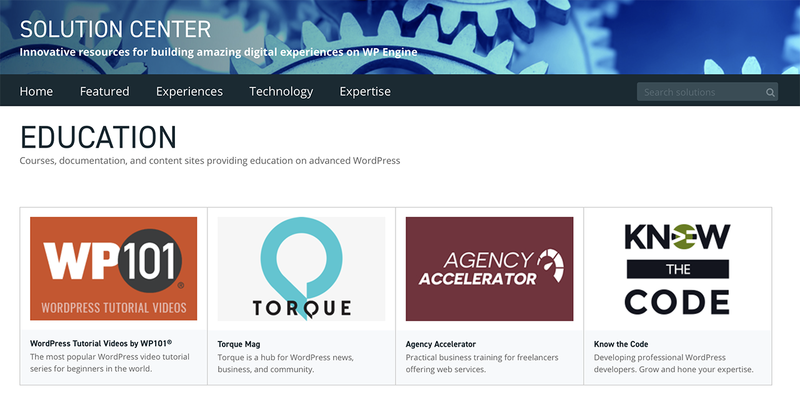 So, we’re incredibly honored that WP Engine has selected WP101 as a recommended WordPress education solution for WP Engine customers. What is the WP Engine Solution Center? The WP Engine Solution Center is a directory of carefully-vetted 3rd party services, plugins, and software that can help you optimize your WordPress site and create better digital experiences for your visitors. Solutions in the directory are organized into 12 categories: site setup, development, speed, security, marketing, design, ecommerce, site enhancements, content, site elements (like forms, galleries, etc. ), education, and service companies. WP Engine is the world’s leading WordPress digital experience platform that gives enterprises and agencies the agility, performance, intelligence, and integrations they need to drive their business forward faster. WP Engine’s combination of tech innovation and an award-winning team of WordPress experts are trusted by over 80,000 companies across over 140 countries to provide counsel and support helping brands create world-class digital experiences. Founded in 2010, WP Engine is headquartered in Austin, Texas, and has offices in San Francisco, California; San Antonio, Texas; London, England; and Limerick, Ireland. WP Engine Recommends WP101 as a Top WordPress Education Site appeared first on WP101 WordPress Tutorials.